Podere Patrignone is a beautiful tastefully restored 15 C Tuscan farm. It is located just 10 minutes from the beautiful town of Castellina in Chianti, with its mediaeval castle, excellent restaurants, supermarket, food and produce outlets and craft shops. 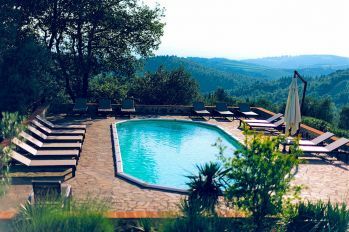 Agriturismo Podere Patrignone is set on top of a hill in 150 acres (55 Ha) of forest, olive trees and grape vines, with uninterrupted, 360 degree views over the Elsa valley, with the towers of San Gimignano shining in the distance. It's the perfect setting for peaceful walks, sunbathing, cycling and exploring. It has a lovely swimming pool with one of the best vistas in Tuscany. Wake up to bright sunshine reflecting off the misty valley below, the beautiful views of the surrounding Tuscan vineyards, or enjoy a glass of Chianti Classico wine while enjoying the magnificent sunset over the towers of San Gimignano and the snow-capped Apennines beyond. Podere Patrignone has 6 self-contained Tuscan apartments to rent plus one large villa. The five apartments sleep between 2 and 6 people. Every bedroom has its own private en suite bathroom. 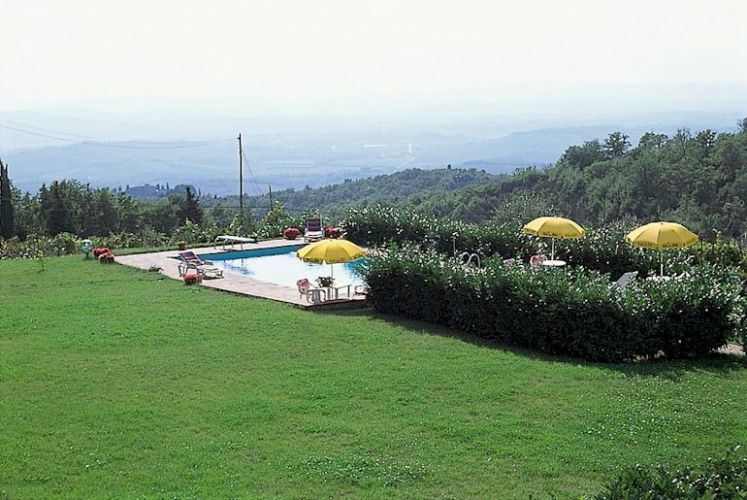 Villa Patrignone comfortably sleeps 8 to 14 people in 7 double bedrooms, each with a private bathroom. The minimum rental is with 4 bedrooms. It has a huge traditional kitchen with seating for 14 people and a lovely fireplace, and a large living room with comfortable chairs. Outside, there is lots of room for you to relax, dine al-fresco, barbecue, and enjoy a glass of wine with friends at sunset. Our swimming pool has the most amazing views in every direction, and hammocks under shady oak trees where you can snooze. There is a free Wifi, and an Honesty Bar where you can help yourself to a glass of wine or a cold beer. And your kids will love it here. We have a tree-house, a trampoline, a sand-pit and a tree-swing, plus lots of forests and streams to explore, all this is far enough away that other guests aren’t disturbed. 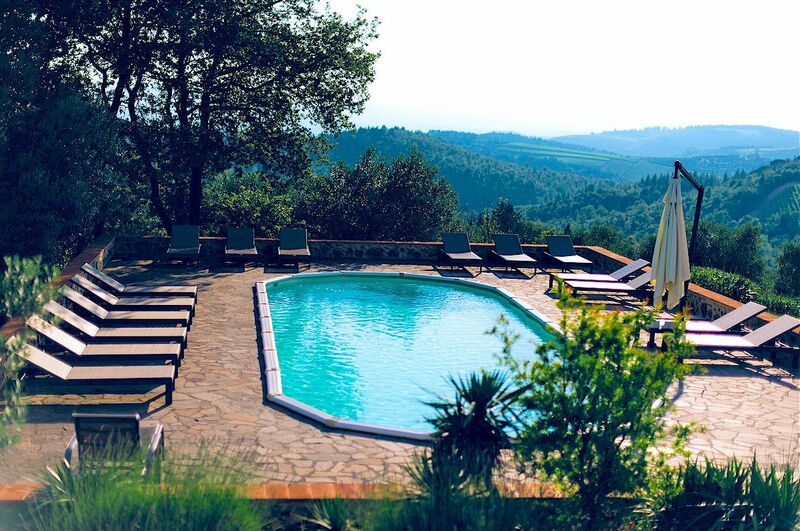 We hope you will join us in our slice of Chianti paradise. More information about Podere Patrignone Tuscany vacation villa and apartments. 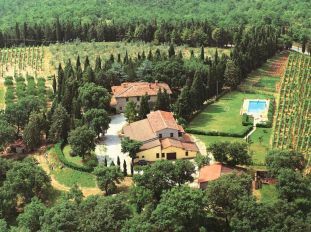 Azienda Agricola "Il Villino" is a winery located 2 km from Castellina, offering two vacation apartments, each for 3 (+1) persons. The farm is located above the valley that runs towards Siena and, indeed, Siena is visible in the distance. The swimming pool offers a wonderful view over the valley. Il Villino produces a Chianti Classico wine and those interested in wine-making have the opportunity to visit the cellar and see the various phases of production. 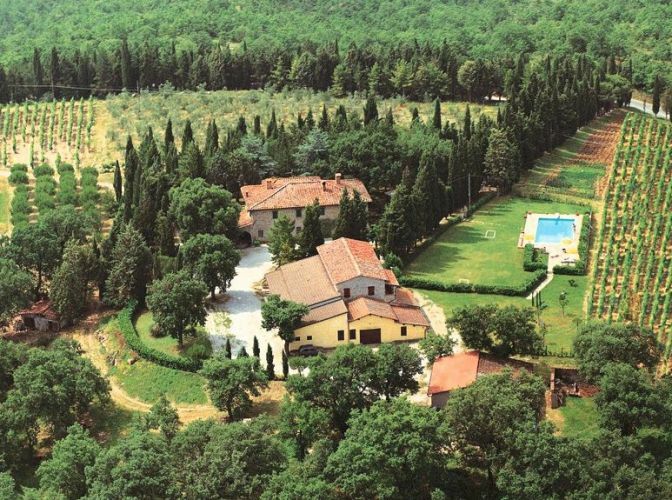 The location is elevated and peaceful - an ideal venue for your vacation in Tuscany. More information about Il Villino Chianti vacation apartments. 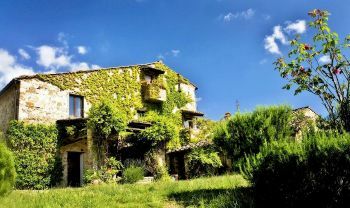 Click here for a larger selection of beautiful farm house vacation rentals, apartments and Bed & Breakfast rooms in Chianti, plus all you need to know about the Chianti Classico zone of Tuscany.